Chondrosarcoma is a malignant tumour of cartilage. It is in the chondro-osseous grouping of tumours and can be lumped into the much large category of the soft tissue lesions. Usually a good prognosis - 75% five year survival in one large data set. Subtypes vary substantially - chondrosarcoma NOS and myxoid chondrosarcoma have a five year survival of ~70%, but mesenchymal chondrosarcoma only ~50%, and dedifferentiated chondrosarcoma an abysmal ~0%! Grade and stage are independent predictors of survival. Usually arise in a (benign) abnormality of cartilage (e.g. osteochondroma, enchondroma). Maffucci syndrome (multiple enchondromas and hemangiomas). Chondrosarcoma not otherwise specified (NOS) ~83% of cases. Juxtacortical chondrosarcoma <1% of cases. Myxoid chondrosarcoma ~10% of cases. Mesenchymal chondrosarcoma ~4% of cases. Dedifferentiated chondrosarcoma ~1% of cases. Appendicular skeleton ~45% of cases. Axial skeleton ~30% of cases. Soft tissue ~10% of cases. Peripheral chondrosarcoma are very rare. Chondrosarcoma is the most common primary malignant chest wall lesion. The classical location is anterior (costochondral arches or sternum), where it is more common than chondroma. +/-Nuclear atypia - high grade lesions. Infiltration of lamellar bone ("invasion") - not common - diagnostic. More cellular than cartilage... but relatively paucicellular compared to other sarcomas. Low grade chondrosarcoma are not cytologically malignant; the diagnosis rests mostly on radiologic findings. The exception is infiltration of lamellar bone -- this is diagnostic of chondrosarcoma. Osteosarcoma - esp. chondroblastic osteosarcoma - has osteoid, may be focal. Small cells with eosinophilic cytoplasm. Chondroid syringoma - These are dermal based, circumscribed and much smaller. Originally thought to be a variant of myxoid chondrosarcoma of bone; however, may not be a chondrosarcoma at all. Characteristic chromosomal translocation: t(9;22) CHN-EWS. In one series (22 patients) 5-year survival ~20%. All dead in two years in another series (25 patients). 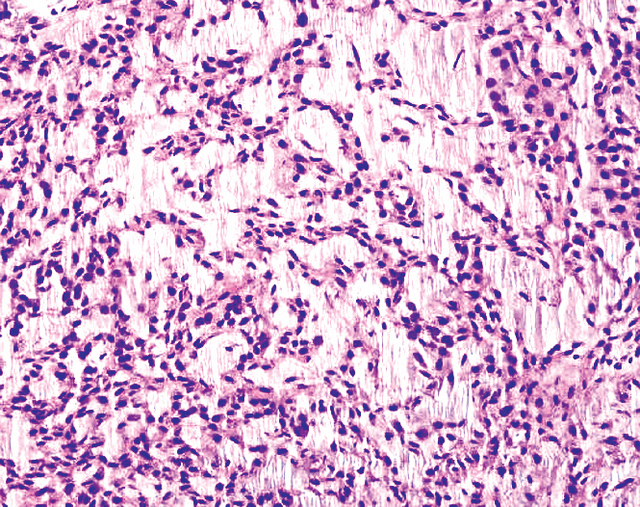 Undifferentiated pleomorphic sarcoma - no cartilaginous component. 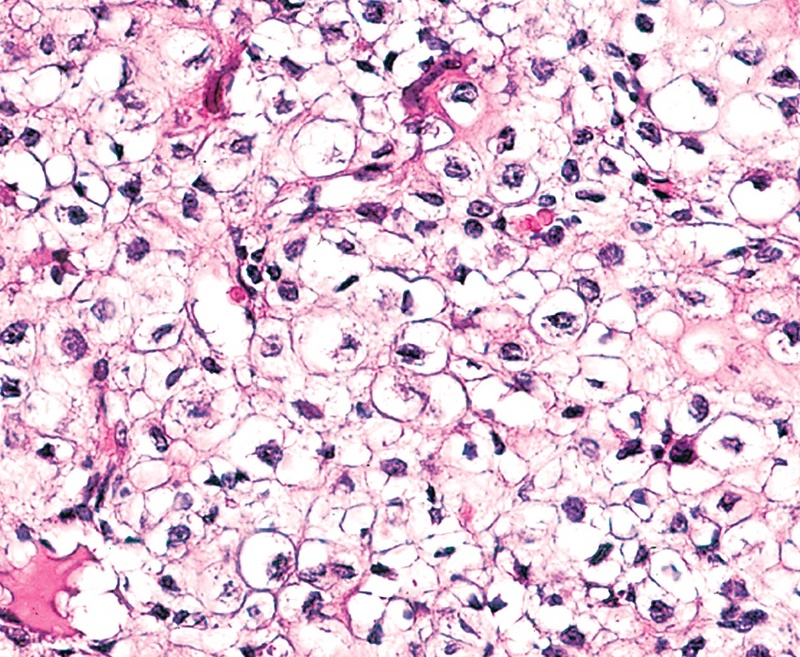 Other dedifferentiated tumours, e.g. 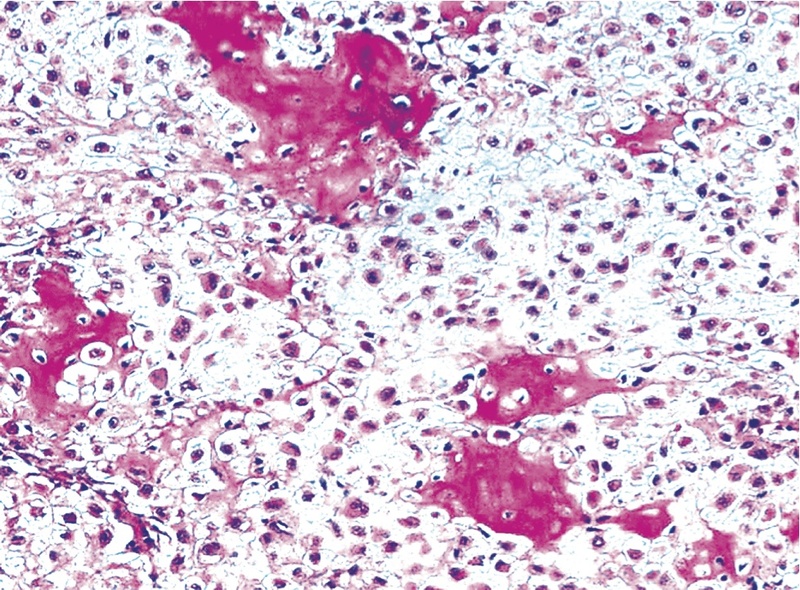 dedifferentiated liposarcoma, with a minimal differentiated component. Grade I: mild-to-moderate increase of cellularity +/- binucleated cells. Grade II: between Grade I and Grade III. 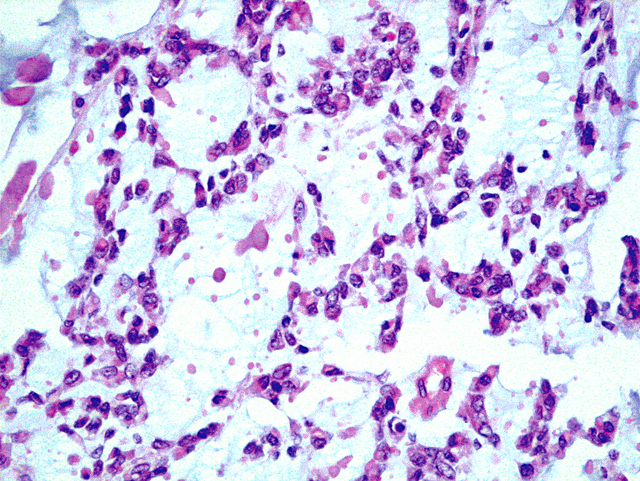 Grade III: nuclear pleomorphism, mitoses common. ↑ Damron, TA. ; Ward, WG. ; Stewart, A. (Jun 2007). "Osteosarcoma, chondrosarcoma, and Ewing's sarcoma: National Cancer Data Base Report.". Clin Orthop Relat Res 459: 40-7. doi:10.1097/BLO.0b013e318059b8c9. PMID 17414166. ↑ 2.0 2.1 2.2 2.3 Giuffrida, AY. ; Burgueno, JE. ; Koniaris, LG. ; Gutierrez, JC. ; Duncan, R.; Scully, SP. (May 2009). "Chondrosarcoma in the United States (1973 to 2003): an analysis of 2890 cases from the SEER database.". J Bone Joint Surg Am 91 (5): 1063-72. doi:10.2106/JBJS.H.00416. PMID 19411454. ↑ Skubitz KM, D'Adamo DR (November 2007). "Sarcoma". Mayo Clin. Proc. 82 (11): 1409–32. PMID 17976362. http://www.mayoclinicproceedings.com/content/82/11/1409.long. ↑ Henderson, ER. ; Pala, E.; Angelini, A.; Rimondi, E.; Ruggieri, P. (2013). "Dedifferentiated peripheral chondrosarcoma: a review of radiologic characteristics.". Sarcoma 2013: 505321. doi:10.1155/2013/505321. PMID 23589702. ↑ Somers, J.; Faber, LP. (Jul 1999). "Chondroma and chondrosarcoma.". Semin Thorac Cardiovasc Surg 11 (3): 270-7. PMID 10451259. ↑ IAV. 26 February 2009. ↑ Klatt, Edward C. (2006). Robbins and Cotran Atlas of Pathology (1st ed.). Saunders. pp. 417. ISBN 978-1416002741. ↑ Dickson, B. 28 April 2011. ↑ URL: http://www.path.utah.edu/casepath/ms%20cases/MSCase6/MSCase6Part3.htm. Accessed on: 29 December 2013. ↑ Fisher C (May 2000). "Parachordoma exists--but what is it?". Adv Anat Pathol 7 (3): 141–8. PMID 10809219. ↑ Corradi, D.; Bacchini, P.; Campanini, N.; Bertoni, F. (Nov 2006). 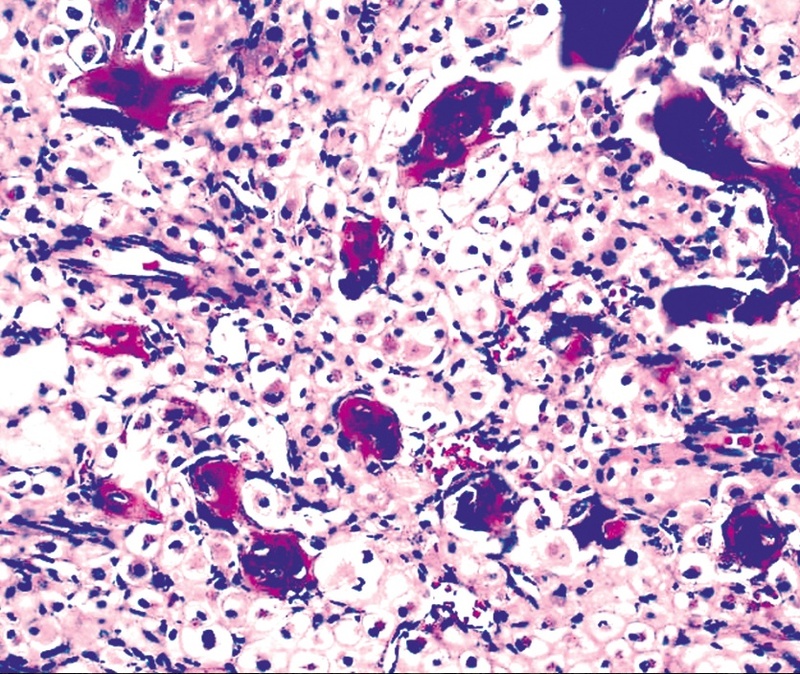 "Aggressive clear cell chondrosarcomas: do distinctive characteristics exist? : a report of 4 cases.". Arch Pathol Lab Med 130 (11): 1673-9. doi:10.1043/1543-2165(2006)130[1673:ACCCDD]2.0.CO;2. PMID 17076530. ↑ Mokhtari, S.; Mirafsharieh, A. (2012). "Clear cell chondrosarcoma of the head and neck.". Head Neck Oncol 4: 13. doi:10.1186/1758-3284-4-13. PMID 22520362. ↑ 13.0 13.1 Aigner, T.; Oliveira, AM. ; Nascimento, AG. (Feb 2004). "Extraskeletal myxoid chondrosarcomas do not show a chondrocytic phenotype.". 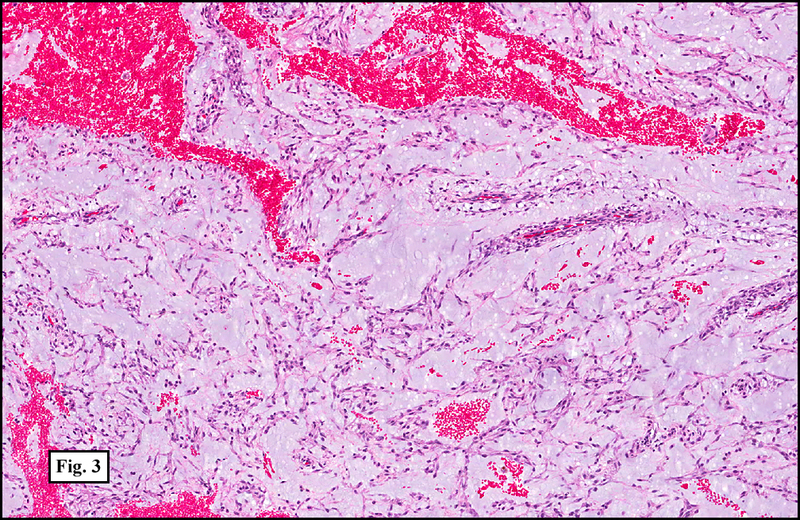 Mod Pathol 17 (2): 214-21. doi:10.1038/modpathol.3800036. PMID 14657948. ↑ URL: http://www.cttr.org/cms/?p=736. Accessed on: 1 May 2011. ↑ Mitchell, AD. ; Ayoub, K.; Mangham, DC. ; Grimer, RJ. ; Carter, SR.; Tillman, RM. (Jan 2000). "Experience in the treatment of dedifferentiated chondrosarcoma.". J Bone Joint Surg Br 82 (1): 55-61. PMID 10697315. ↑ 16.0 16.1 Sopta, J.; Dordević, A.; Tulić, G.; Mijucić, V. (Feb 2008). "Dedifferentiated chondrosarcoma: our clinico-pathological experience and dilemmas in 25 cases.". J Cancer Res Clin Oncol 134 (2): 147-52. doi:10.1007/s00432-007-0262-5. PMID 17653766. ↑ Humphrey, Peter A; Dehner, Louis P; Pfeifer, John D (2008). The Washington Manual of Surgical Pathology (1st ed.). Lippincott Williams & Wilkins. pp. 643. ISBN 978-0781765275. This page was last modified on 6 February 2016, at 12:53.